'They don't want it slipping through their fingers': Just what is happening with the Cork Event Centre? This week, an appeal for more money was put forward. But not that much work has been done on the site to date. An early depiction of what the site could look like. ON 12 FEBRUARY 2016, two weeks before the general election, Taoiseach Enda Kenny and the then-Tánaiste Joan Burton visited Cork. During their tour of the city, they stopped by the site of the old Beamish & Crawford brewery – founded in 1792 but long since closed – and posed for photographs alongside Cork’s own Minister Simon Coveney and Mayor of Cork Chris O’Leary. Dressed in hard hats and fluorescent vests, the group staged a ‘turning of the sod’ on the site. At one point, Enda Kenny helped to merrily chuck a pile of earth into the air. It was a momentous occasion: a sign that, finally, the Cork Event Centre was going to get underway, due to open in 2018. The announcement was described at the time as “immense”: a site that had been empty since 2008 would be vibrant once again. The site earmarked for the venue was the former Beamish brewery, located next to the river and almost in the shadow of St Finbarre’s Cathedral and Elizabeth Fort. Its counting house, with its Tudor-style facade, is one of the city’s most striking buildings. But since the turning of the sod, very little visible work appears to have happened on the site. 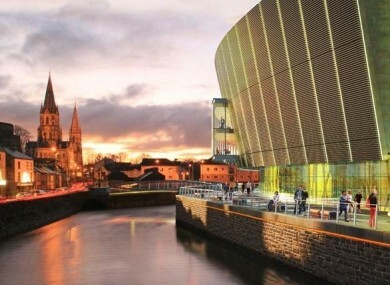 And since the end of last year, people in Cork have been asking: Just what is happening with the event centre? It’s a story that the local media have been following in earnest – and one that had the Lord Mayor of Cork withdrawing some of the comments he made about the “appalling” delays to the project in an interview with the daily paper the Evening Echo. The tender for the centre was won in December 2014 by the Heineken/BAM consortium (Heineken is no longer involved), who beat another tender from O’Callaghan Properties, led by the developer Owen O’Callaghan, who has since passed away. Part funding for the €150 million project was to come from the Government and Cork City Council. It’s clear that the centre represents an opportunity for business and tourism in Cork – but the delays have people wondering when they’ll see the building in place. The questions around the project have grown to the extent that a parody Twitter account has been set up in the centre’s name. This week, there were two new twists to the tale: BAM Contractors (which has teamed up with Live Nation for the centre), met Cork City councillors for a two-hour long, private meeting. At the meeting, BAM asked for an extra €12m in State funding for the venue. The government had already pledged €20 million in investment in the site. A representative from BAM didn’t talk to the media after the meeting. Then, on Saturday, it was reported that BAM Property had received planning permission to build extra student accommodation on the very same site. The Evening Echo reported that in September 2016, BAM had made submissions to reduce office and shop space on the site so that the number of student beds could be increased. On Wednesday, the Irish Examiner reported that the new plans for the site- with it set to go from 10,000 sq m to 13,500 sq m – could mean that the developers will have to apply for new planning permission, again raising fears that the site won’t be seeing any action any time soon. A week previously, Minister Coveney went on Red FM to allay fears about the site, saying that yes, it will be built. “It became clear that the view of Live Nation in particular was that this was going to cost more than €150m to build the kind of quality facility that would be a success,” said Coveney. Speaking to people in Cork this week, it’s clear that there is some impatience with how long the project is taking to get underway – but there are strong hopes that, once it is constructed, it could finally plug a huge gap in the city’s entertainment scene. With a projected 6,000 capacity, and use as a venue and conference centre, the Cork Event Centre could bring in big business and tourism to the city by the Lee. Mick Finn, an independent councillor for Cork City South-Central, said the project is “at a crucial stage at this juncture”. He said that councillors were told at this week’s meeting with BAM that the internal size of the event centre has been increased from what was initially planned during the tender process. “What the operators Live Nation are looking for is a facility that can function like the Bord Gáis Energy Theatre, 3Arena and the Convention Centre under the same roof,” he explained, which has led to extra costs. TheJournal.ie contacted BAM for a statement but have not received one. “BAM is seeking overall an extra €12million in central government funding,” said Finn. After asking for €12m and €8m in local government funding. I would support the calls for that – I would think it has been a long time coming. He believes the money is worth it, given the revenue it will generate not just for the city, but the greater Cork region. He pointed out that this isn’t the first attempt to get an event centre up and running in Cork, and said that people have been “frustrated by the delays”. As a local representative of the area, he’s seen it “falling into disrepair over the years”. “I think this project is a game-changer,” he said. But he said that regarding any future funding, “in return for that I think we need to have a definite start date and a definite time period”. He said that the councillors were told the project would begin this September and be completed within 18 months. “Unfortunately, we have heard that before,” he said. Finn sees the centre as having the potential to “lift all boats” in Cork. That sentiment is echoed by Red FM DJ Stevie Grainger, who is a lynchpin of the city’s music scene since his days at the legendary Sir Henry’s nightclub. That nightclub, now demolished, stood across the road from where the Cork Event Centre is going to be located. “I’ve been writing about [the lack of an event centre in Cork] for 10 years and it’s a massive frustration,” said Grainger, who has watched as other city venues like the Savoy and the Pav – both former cinemas in their previous lives – closed down. He’s helped bring numerous acts to the city, including Kanye West, and knows full well the impact a large-scale event centre could have. “We’ve been talking about this for probably 15 years, it was a pipe dream and when we found out it was going to happen we were delighted,” he said of this latest project. BAM Contractors also worked on the old Capitol Cineplex site, now being turned into retail and office space. It’s just around the corner from the Beamish & Crawford site, on the Grand Parade, and work has been going well there. “We saw the same developers put up the Capitol site practically overnight so we know they can build,” pointed out Grainger. For him, if people “saw something being built” on the Beamish & Crawford site, they’d feel positive about the outcome. Pairc Uí Caoimh can attract major artists, like Bruce Springsteen, but it’s not going to be operating on the same frequency as Cork Event Centre. What’s ironic, he said, is that this isn’t a reflection of the energy on the ground when it comes to opening new ventures. “There’s an appetite in Cork; the city is buzzing, restaurants, hotels a lot of good stuff happening in the grassroots and the arts,” he said. At the moment there’s a massive vacuum. Everyone knows the massive knock-on effect from this would be amazing. “I love the city and tons of people do,” said Grainger, but added that the emptiness of Patrick’s Street at night can be “embarrassing”. One person who does not welcome the appeal for more State funding is Anti Austerity Alliance councillor Fiona Ryan. At the meeting with BAM, she said she outlined “the concerns that the public have relating to the lack of transparency regarding the delays”, and said she was “quite shocked” at the response. While she agrees with BAM about how beneficial the event centre would be to Cork city and the Exchequer, she believes that the centre should be 100% publicly owned. I think obviously the thing that’s going to come to the forefront of this was the spoof of a sod turning that happened in the run-up to the general election last year which gave the impression it would be a matter of weeks before construction was built. “From start to finish I think primarily ordinary people, the taxpayer, the people funding this enterprise have been treated with disrespect,” said Ryan. Conor Healy, Chief Executive of Cork Chamber of Commerce, described the centre as a “hugely important project for Cork… which will be hugely beneficial to the local economy, and it’s a very necessary piece of infrastructure for Cork”. He added that no public funding has been provided to or spent on the project to date. The money was earmarked by Cork County Council and “all of that is still there and it’s available to the project – none of it has been spent”, said Healy. Blackrock Labour Local Area Representative Peter Horgan criticised the fact that the questioning of BAM was not held in public session. ”This is public money that is being requested,” said Horgan. The request from BAM for the extra €12m will be considered by Cork City Council, said Cllr Mick Finn. In the meantime, no new work on the site has been publicly announced. For the people of Cork, the main priority now seems to be ensuring that the project doesn’t stall. “It’s so close, they don’t want to see it slipping through their fingers,” said Finn. Email “'They don't want it slipping through their fingers': Just what is happening with the Cork Event Centre?”. Feedback on “'They don't want it slipping through their fingers': Just what is happening with the Cork Event Centre?”.